Seeing all these doors has added a new dimension to my thoughts about what makes a home, as doors are portals to a home. 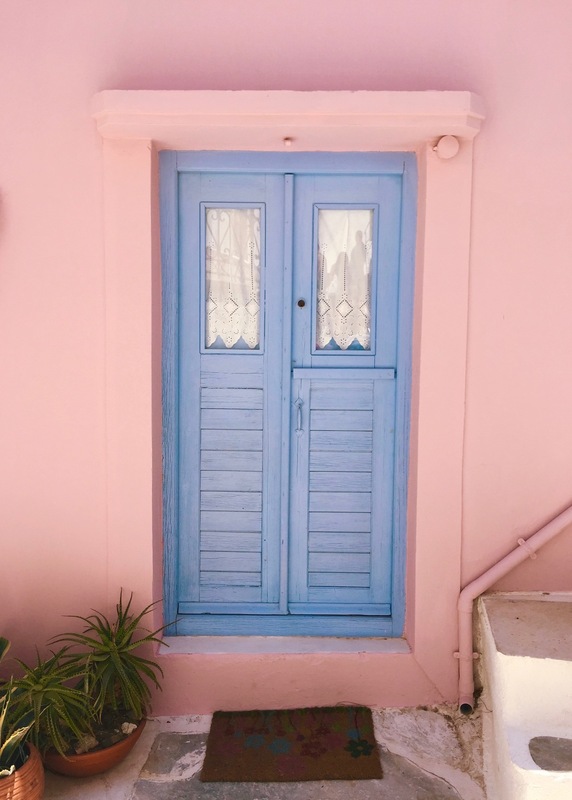 My first day in Syros (when I was staying elsewhere on the island), I took a photo of my host’s front door as a way to remind myself which house to come back to at night. I do this everywhere I travel. My apartment door in Los Angeles is identical to the door of hundreds of other units on the premises. Last month, a confused couple tried to open my door with their own key simply because they mistook my door for theirs. This would not happen in Syros. I’m not sure where these thoughts are going, but my brain is spinning, thinking about doors being portals, signifiers, symbols, invitations to a home. What does it mean if your portals looks identical to all the other portals? How important is differentiation or customizability in establishing home? Is a home really a home if it has one hundred clones? For what it’s worth, the day after my neighbors tried to enter my unit, I went out and bought a doormat. I think it helps. Perhaps my subconscious already knows how to make a home. This post originally appeared on the Sound/Word residency blog. Become a patron to support my music and receive special rewards!